Fencing is often thought of as an outdoor domain, but it has plenty of applications indoors for commercial use as well. Caging is commonly required in facilities where indoor storage of large components is necessary. Learn how interior caging can be used for your commercial facility in this week’s blog. Interior caging is often used in parking garages and large warehouses for storage and security purposes. Caging can be designed as a stand-alone unit, connected to a wall or other barrier, or as an enclosure for an area that protrudes inward and only requires fencing on one side. For security purposes, locking panels provide protection from vandals and thieves. PVC screening can also be used to obscure the contents of the cage from view for added security. Chain link fence is the most common type of fence used for interior caging applications. The ease of installation and versatility of chain link fence make it the ideal fence solution for interior caging. Chain link fence also helps solve issues with space constraints as it is easily cut and fit to shape. Storage possibilities for interior caging are limited only to the dimensions of your interior space. Large mechanized equipment can easily be stored in interior caging provided you have the space. Interior storage is important not only for freeing up outdoor space but also for protecting equipment from the elements. 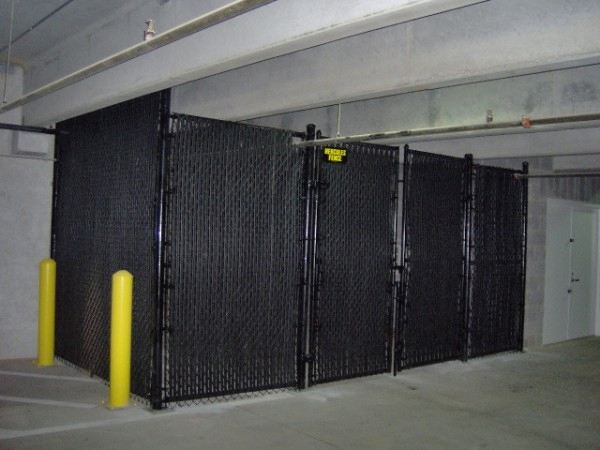 For more information about interior chain link caging, contact Hercules Fence of Richmond today. This entry was posted on Thursday, August 21st, 2014 at 8:38 pm. Both comments and pings are currently closed.